APPSC Deputy Surveyors, Surveyors, Assistant Architectural Draughtsman Results 2017: APPSC Assistant Architectural Draughtsman, Surveyors in A.P. Town and Country Planning Subordinate Service and Deputy Surveyor in A.P. Survey & Land Records Subordinate Service (General Recruitment): APPSC has published the Deputy Surveyor, Surveyors, Assistant Architectural Draughtsman Recruitment 2017 notification and applications are invited online from qualified candidates to the post of Assistant architectural draughtsman in a.p.town and country Planning subordinate service, Surveyors in a.p.town and country planning subordinate service, Deputy surveyor in a.p. survey & land records subordinate service in the State of Andhra Pradesh. The proforma Application will be available on Commission’s Website (www.psc.ap.gov.in) from 24/12/2016 to 23/01/2017 (Note.22/01/2017 is the last date for payment of fee up- to 11:59 mid night). Assistant Architectural Draughtsman, Surveyors in A.P. Town and Country Planning Subordinate Service and Deputy Surveyor in A.P. Survey & Land Records Subordinate Service (General Recruitment). Recruitment to AAD/Surveyor/Deputy Surveyor(Notification No. 24/2016), calling of further candidates for verification of certificates may further details (Published on 29/12/2017). Must have passed All India Trade Test for Surveyor course conducted by the Industrial Training Institute, Government of A.P. with experience in Town Planning or Engineering or Survey for a period of not less than one year. Licentiate in Architecture Apprenticeship in the case of the present incumbents. APPSC Deputy Surveyors, Surveyors, Assistant Architectural Draughtsman Results 2017: APPSC Deputy Surveyors, Surveyors, Assistant Architectural Draughtsman Results 2017 are declared on May 29 on APPSC Web portal. The list of candidates provisionally admitted for verification of original certificates for the posts of ASSISTANT ARCHITECTURAL DRAUGHTSMAN (P.C. 01), SURVEYORS (P.C. 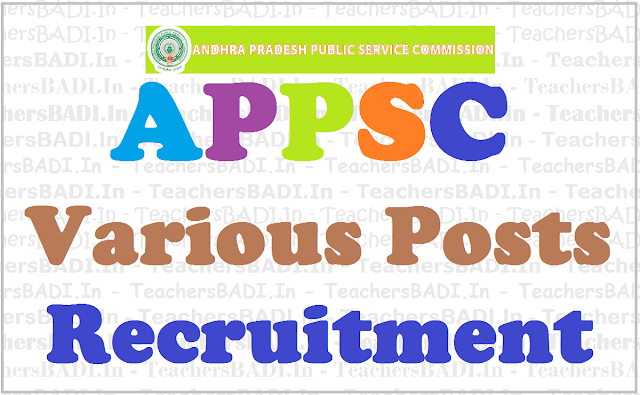 02) IN A.P.TOWN AND COUNTRY PLANNING SUBORDINATE SERVICE AND DEPUTY SURVEYOR (P.C. 03) IN A.P.SURVEY AND LAND RECORDS SUBORDINATE SERVICE vide Commission’s Notification No.24/2016 is placed on Commission’s website www.psc.ap.gov.in. The verification of original certificates will be held from 19-06-2017 to 21-06-2017 at 10.30 AM on wards in the Commission’s Office. The detailed date wise schedule of verification of certificates may be seen in the Commission’s website. 1. It is hereby notified that on the basis of the Examination held on 05/03/2017 at 13 districts of Andhra Pradesh and Hyderabad in Telangana State for Assistant Architectural Draughtsman (P.C. 01), Surveyors (P.C. 02) in A.P. Town and Country Planning Subordinate Service and Deputy Surveyor (P.C. 03) in A.P. Survey and Land Records Subordinate Service (General Recruitment) vide commission’s Notification No: 24/2016 dated. 23/12/2016, Corrigendums to the Notification No.24/2016, dt.31/12/2016 and 18/01/2017, the candidates with the following Register Numbers have been provisionally admitted for verification of original certificates in terms and conditions of Notification No.24/2016.The list is prepared considering category wise merit. The verification of original certificates scheduled to be held from /06/2017 to /06/2017 and candidates are directed to attend at 10.30 AM in the Commission’s Office, Prathibha Bhavan, Opp. Gagan Vihar, M.J. Road, Nampally, Hyderabad – 500001. The day wise schedule for verification of Original certificates kept in the Commission’s website. Out of the above list, if required candidates do not turn up for verification in any category candidates next in merit list will be called. The result copy can also be seen in the Commission’s Notice Board. 2. The candidates provisionally admitted for verification of certificates are required to produce the Original Certificates at the time of verification of documents, relating to Age (SSC), proof of age relaxation, Qualifications, Study certificate, Integrated Community certificate in case of reserved candidates, certificate of exclusion from Creamy layer in case of B.Cs from Revenue authorities in terms of G.O. Ms. No.3, Backward Classes Welfare (C-2) Department, dt.04/04/2006 and G.O.Ms.No.26, BC Welfare (C) Dept., dt.09/12/2013, P.H. certificate in case of disabled candidates, migration certificates for candidates who migrated from Telangana to Andhra Pradesh etc., failing which, they will not be treated as eligible with reference to the particulars furnished by him/her in the Online application form / Certificates. The results of such candidate(s) shall be cancelled at any stage in the process of selection. The Commission has the right to disqualify any candidate, if he/she is not found eligible for any reason. Candidates are directed to download the call letter, Two (2) checklists and Two (2) Attestation forms from the Commission’s website www.psc.ap.gov.in. Marks lists of all candidates who appeared in the examination is also available on website. Web Note: Attention: Candidates called for verification of certificates to the posts of ASSISTANT ARCHITECTURAL DRAUGHTSMAN (P.C. 01), SURVEYORS (P.C. 02) IN A.P.TOWN AND COUNTRY PLANNING SUBORDINATE SERVICE. AND DEPUTY SURVEYOR (P.C. 03) IN A.P.SURVEY AND LAND RECORDS SUBORDINATE SERVICE (GENERAL RECRUITMENT) vide Commission’s Notification No.24/2016 Dt: 23-12-2016, the verification would be done in Morning and Afternoon session on each as given below. As there is space constraint, only candidates would be allowed into the Verification Hall. Last date for submission of Online application: 29/01/2017.